Mens Small (S) 25-30" 18"
Mens Medium (M) 27-33" 20"
Mens Medium Long (ML) 27-33" 22.5"
Mens Large (L) 34-38" 22.5"
Mens Extra Large (XL) 39-46" 22.5"
Mens Extra Extra Large (XXL) 47-54" 22.5"
* Waist Measurement in Inches DO NOT USE YOUR PANTS SIZE. **Men's Medium Waist Tip: If you are taller than 5'9", you want to get the Medium-Long size. If you are 5'9" or shorter, the Medium will be fine. See this Video for more sizing and product information. All Sport Kilts are pleated, but you can give your kilt that custom fitted shape with a leaner profile by having us sew down the pleats. The first 4-5 inches of pleats (measured from the waistband) are sewn down along the knife edge of the pleat (vertically). This provides a more refined look and makes for easier care and pressing. PLEASE NOTE: We cannot accept returns for customized goods, i.e., belt loops, sewn pleats, custom length. Please make sure of your measurements! You can add two 1" wide black leather straps and nickle-plated buckles to the opening end of your Sport Kilt. A functional, traditional looking adjustable double strap. You can also choose a Nylon Buckle Strap option as well. Although you don't need a belt to hold up your kilt, we'll be glad to add 'em so you can wear your favorite belt. Belt loops can also be used to thread your sporran "chain-belt" through. This is the traditional use of belt loops on a kilt. TIP: Belt Loop size should be at least 1/4" larger than the belt width in order to have room for the belt hardware, e.g., the keeper. Please note: We cannot accept returns for customized goods, i.e., belt loops, sewn pleats, custom length. Please measure carefully! The ideal kilt length: While kneeling, measure from the top of your waist (where you'd wear your kilt) to the floor. Some say your kilt should just brush against the ground when you are kneeling. Of course personal preference is the rule! Have it YOUR way. 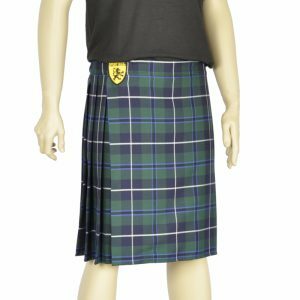 Note: Ultimate and Commando kilts tend to sit higher on the waist (more like a traditional kilt) than our standrard Sport Kilts. Therefore, you may want to add an extra inch or two in length to compensate. If in doubt, be assured that ninety five percent of the time, our standard size Medium-long, large, XL, abd XXL length of 22.5 inches will fit most guys 5' 10" and 6' 2" tall. 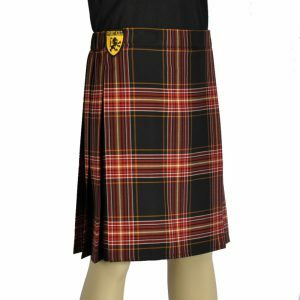 Ramsay tartan Original Sport Kilt!